Census returns are official Government of Canada records that enumerate the country's population. They are an invaluable source of information for genealogy research. Starting in 1851, most census records included the names of every resident, their country or province of birth, age and many other details. Library and Archives Canada holds an extensive collection of Canadian census records from 1640 to 1926, and for Newfoundland from 1671 to 1945. Our holdings are listed in the sections below. From 1851 to 1901, a census occurred every 10 years in Canada; this was confirmed by the British North America Act, also known as the Constitution Act, 1867. The original purpose of the census was to help determine parliamentary representation based on population. The first census of the Dominion of Canada was taken in 1871. Before that, census enumerations were conducted in different areas in various years. Many of those early records have not survived, including portions of the 1851 census. As provinces joined Confederation, they were included in subsequent federal census returns, for example Prince Edward Island in 1881. According to the Census and Statistics Act of 1905, a general census of Canada was to occur in 1911, and every 10 years thereafter, and a census of population and agriculture was to be taken in Manitoba, Saskatchewan and Alberta in 1906, and every 10 years thereafter. Census returns before 1851 are usually only partly nominal. Only the names of the head of each household were recorded, not the names of other household members. Most returns from 1851 to 1926 are nominal, listing each person individually. They provide details such as age, marital status, country or province of birth, religious denomination, racial or ethnic origin, occupation and education. In some years, the census also indicates year of immigration. For each census, the records are arranged by province or territory. They are divided into districts, based on federal electoral districts, which usually correspond to counties and cities. Districts are divided into sub-districts, corresponding to townships, civil parishes and larger towns. In some years there were also agricultural returns, which contain details about acreage, livestock and agricultural products. Those census schedules were usually not retained. For the Census of the three provisional districts of the North-west Territories, 1884-5 (Assiniboia, Saskatchewan, Alberta) and the Census of Manitoba 1885-6 only the statistical summaries have survived. There are no nominal records. The following list shows all Library and Archives Canada's census records that are searchable in databases on our website. Click on the Database name and year to open that database page. Each database has its own search screen and search help, including a list of the column headings, instructions to the enumerators and other resources. Each one also has a section about issues or problems relevant to that particular census and database. 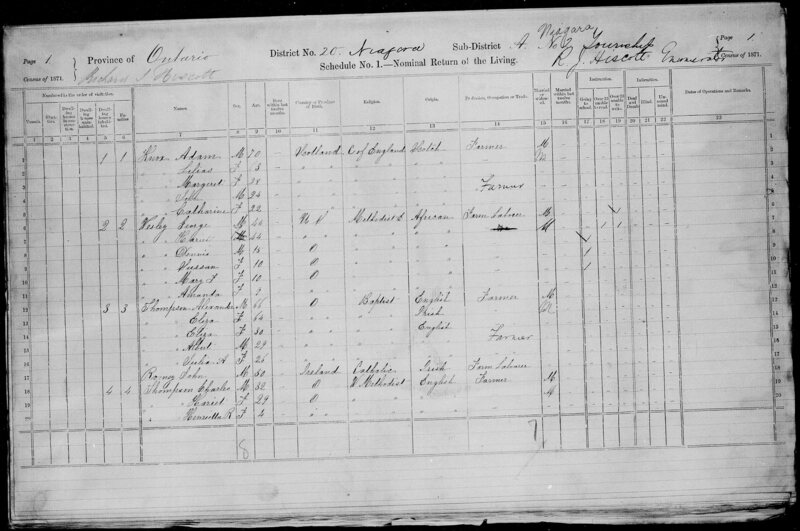 If you find a database entry of interest, click on the pdf or jpg link to see the digitized image of the census page. Click on the database item number to see the full archival reference. That screen includes a Suggest a Correction button. Note that we only correct indexing errors, not errors in the actual record. Important note: When searching a database, keep in mind that spelling variations of names are common. Also, it is sometimes difficult for indexers to interpret the handwriting of the census enumerators, especially on pages with poor legibility, so databases contain many errors and omissions. If you cannot find a name in a database, you should search the census pages for the place where your ancestor resided. See Research Tips. In the 1980s, volunteer genealogists from the Ontario Genealogical Society (OGS) indexed the names of the heads of households from the 1871 Census of Canada for the province of Ontario. The volunteers included the names of "strays" (people with a different surname living in the household), as well as the names from Schedule 2 (deaths in the previous twelve months). The index was published in 30 volumes. In partnership with Library and Archives Canada, the OGS data was used to create the first genealogy database on our website. That database does not include links to digitized images. See Census of Canada, 1871: Ontario heads of household. More than 20 years later, the census records for all provinces and territories, including Ontario, were indexed through a partnership with Ancestry. All names were indexed and all of the database entries are linked to digitized images. See Census of Canada, 1871. You will find differences in the indexing of some names between the two databases. Library and Archives Canada holds many other census records that are mostly available only on microfilm. Finding Aid 300 is a comprehensive guide to those early census and related records, which date from 1640 to the 1800s. There are also some records from the 1900s, including Newfoundland and Labrador, 1921 to 1945. Before searchable databases were created, a few of our census records were made available on our website by digitizing the microfilm reels. These are helpful if you want to search page by page for a particular place. Consult the relevant list of districts and sub-districts to identify the microfilm reel of interest to you. Census of Canada, 1871 (Archived) This includes all nine schedules. Record Group 10 contains the records created by the former Department of Indian and Inuit Affairs. It includes some census records for First Nations bands. Some are aggregate (statistical) only, some list the names of heads of household and some list all the names in each family. To see what records exist, use Archives Search. Enter the keywords RG10, census and the name of a place, band or agency. If you find a record and it is not digitized online, see our page on how to access the records. Keep it simple - start with just a name or a name and a place. Don't forget the * wildcard. Try Fran* for Frank, Francis, François, Franz, Francisco. Try searching by the person's middle name or nickname. Try variations like Lizzie for Elizabeth, Tillie for Matilda, Nellie for Helen. Spelling variations of names are common in old records. Also, many names were written phonetically, as they sounded to the person recording them. For example, Thibault, Thibeau and Tibo are just three of many variations of that name. Some people anglicized their names. Boisvert may have evolved into Greenwood. Johan Kuch might have started calling himself John Cook. Even the enumerator may have created his own variations, for example, an English speaker might have written Jean-Baptiste as John Baptist. There are many indexing errors and omissions in databases because of poor handwriting in the original documents or pages that are barely legible because of faded ink, very dark ink or other issues on the census pages. In some handwriting, many letters look similar and can cause confusion for indexers. Examples: u and m; w and m; o and a; i and e; u and ee; d and t; f and t; l and t; v and r; g, y, z and j; capital letters L and S, I and J. In old handwriting styles, a double s resembled the letters fs or p.
Confusion over how names were presented on a page can lead to a given name being incorrectly entered in a database as the surname. Inconsistent use of ditto marks can lead to the wrong surname attached to a given name. In some Quebec census returns, women were recorded by maiden name instead of their married name. Discrepancies in details such as dates and places were common in old records. Dates of birth or immigration may have been recalled incorrectly by the family member answering the questions. Also, census enumerators made mistakes. Remember that databases are indexes to the records and are intended to reflect the information as it was recorded on the original page. Many of our census records are indexed on the free websites Automated Genealogy and Family Search. They are also indexed on Ancestry.ca (subscription required; free at many public libraries). Many provincial, county and local genealogical societies publish indexes to census records for their areas. Knowing the geography of the area is important. Census returns were enumerated by Districts and Sub-districts. In most years, the Districts corresponded to a city or county and the Sub-districts corresponded to a town, city ward, township, parish or other local jurisdiction. Small towns and villages were usually enumerated within the surrounding township and not identified separately. Each of our databases includes a list of the Districts and Sub-districts for that census year. In some cases, not all the census returns survived. For some cities, some wards or suburban areas were enumerated in the surrounding county/district. For example, in 1911, parts of Ottawa were enumerated in Carleton County and parts of Montreal were enumerated in the districts of Hochelaga, Jacques-Cartier and Maisonneuve. Also, some districts of Montreal included more than one ward. For example, district 179, Ste-Anne, included Ste-Anne Ward, as well as Centre Ward and West Ward. For help with maps and places, you can try the relevant GenWeb site for the province or county. You can search our Post Offices and Postmasters database. Enter the place name in the Office Name field and if there was a post office there, it will indicate the federal electoral district, which usually corresponded to the county and census districts. For larger cities, consult the annual city directories, which listed adult residents alphabetically and indicated occupation and address. For example, if the person was shown as residing at 102 Abbott Street in 1901, check the street index in the directory to find the names of neighbours on that street. Then try searching those names in the 1901 census database. City directories can also be useful to try to determine the ward for a particular address. Read our blog post What Can Canadian Directories Do for You? to learn more about directories. You can try searching the census page by page for the place where your ancestor lived. Check the list of Districts and Sub-districts to find the relevant numbers. On the database search screen, select Advanced Search Options. Enter the District number and Sub-district number. In some census years, the Sub-district "number" is a letter. Some Sub-districts have more than one part. In the Page Number box, enter 1. From the results, click on the image thumbnail to view page 1. To move to the next image, change the jpg number in the URL box at the top of the screen. For example, for image http://data2.collectionscanada.ca/1871/jpg/4396332_00068.jpg change the jpg number to 00069. For the 1891 census, some of the pages appear out of order because that was the way the records were arranged when they were microfilmed. For the western provinces, you can learn about the land system of Townships, Ranges and Meridians by consulting the section called Western Canada Land System Description in our Land Grants of Western Canada database. Each census database includes lists of other abbreviations used in the records. Our census records have been indexed by other organizations and individuals. Some of those databases include links to digitized images. The last two websites on this list include some indexes from other sources. Census returns after 1926 are in the custody of Statistics Canada. The Statistics Act and the Act to Amend the Statistics Act do not permit the disclosure of personal information from post-1926 census returns. The only exception is for people who require information about themselves, for pension or other legal purposes. See Accessing my census at Statistics Canada. For non-personal information from post-1926 census returns or for questions about the census legislation, contact Statistics Canada. Under the legislation, the records will be opened for public use and transferred to Library and Archives Canada 92 calendar years after the taking of a census.